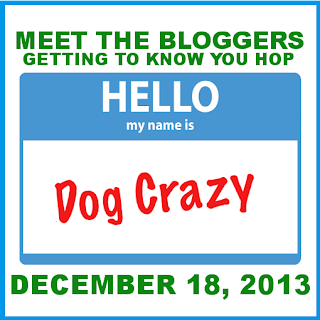 Welcome to the Meet the Bloggers blog hop 2013! A few blogger friends were talking one day and realized we wouldn't recognize each other if we ran headlong into each other at a bar. Er, wait, that's not quite right either. Well, some bloggers finally realized there aren't any pictures of us on our blogs and in an attempt to "peek behind the curtain", a blog hop was born! A blog hop designed specifically to reveal the true identities of the hard-working individuals who bring these marvelous musings of petted bliss (uh - our pet blogs) to life. Uh, mom? Wat'chu smoking? Can I have some? 1. A current photo of the blogger. The remote controller I ordered for my camera came after I suffered some indignity to my face this weekend due to a disagreement I had with a tree so a more current picture will not be forth-coming. This is from 11/16/2013 so it's about as current, if kind of silly, as I have. What's your favorite non-animal related book? Wait, seriously, you want me to name only one? We just had a Facebook thing go around about this and I could barely keep my list to 10, never mind 1. I am a huge fan of Kurt Vonnegut, Graham Greene, J.R.R. Tolkien, J.D. Salinger (not for Catcher in the Rye), and Jean-Paul Sartre. As for individual books, "A Tree Grows in Brooklyn", "I Know Why the Caged Bird Sings", "To Kill a Mockingbird", "The Hitch-hiker's Guide to the Galaxy" and "Bury My Heart at Wounded Knee" were all considered. "There are some who can live without wild things, and some who cannot. These essays are the delights and dilemmas of one who cannot." What's your favorite non-animal related movie? Okay, I'm having the same issue with movies as I did with books. Can I pick one movie per genre? I have watched the Lord of the Rings trilogy a hundred times. But I've also done that with Contact and Strange Days and Ice Age. The Constant Gardener is a favorite as is Oscar and Lucinda. Must Love Dogs (which has so little to do with dogs it doesn't qualify as an 'animal' movie) ranks high as does A Walk on the Moon and Under the Tuscan Sun. I'm sure if I think about this any longer, I will end up with a few hundred more so I'll stop here. Oh wait, here's an actual answer. If you haven't seen it, watch Big Fish. It's something special. What's your favorite non-animal related food? Now who worded this question? What exactly is an "animal related" food anyway? Am I supposed to pick vegetarian meal? Because that would be doable. Here again, I struggle. But since this is the "Meet the Blogger" hop, I will let you in on a not-so-secret secret: I love food. All kinds. And I'm a pretty good cook, too. But since my new favorite expression is "everything's better with goat cheese" I'll go with that for today. I've got lots. Tilda Swinton, Kristin Scott Thomas, Jodie Foster, Ralph Fiennes, David Thewlis, and William Fichtner would probably top the list. What's one thing you have to do every day? I have OCD (Obsessive Compulsive Disorder). You do not want me to answer this question. What is this free time you speak of? Okay, so sometimes I have some. During the winter, you will find me curled up with a good book listening to music and petting the dog in front of the fire. Of course, that happens a whopping 1.32479 times between November and March each year. In the summer though? You will always find me in the garden. Watching the birds. Studying the shifting hues and patterns of the light in the trees. I'm afraid I am not a terribly exciting person. I wish the words people would use would be something like 'gentle', 'kind' or 'caring'. However, I suspect the first word most people would use would be something more along the lines of "serious". Although a few old friends will always think of me as "musical". I would like to believe Bella would call me 'friend'. What is one thing you've done that you're most proud of? We don't want to go there. Remember that "one word" question up thread? A lot of people would probably use the word stubborn to describe me. Here endeth the lesson. My body and I aren't really on speaking terms. My husband. My dog. My garden. What's one thing you could do to be more kind to yourself? Alright, here's another one of those little secrets: I am a perfectionist. No matter what I do, I am never good enough, smart enough, fast enough or strong enough. Just once in my life I would like to look at something I did and not see only its flaws. She's thrilled, can't you tell? I guess people with normal animals probably get driven nuts by things I would love to have to deal with. But Bella isn't normal and life with her isn't always easy. There is nothing she does that "drives me nuts". There are things she does that scare the life out of me. And makes our life more difficult and complicated. Things I haven't even talked about on the blog yet. But you asked about that one thing that I'm most proud of in life earlier? It's her. For all her faults and failings, to see her succeed at something that scared her, to take a horrible situation and turn it into a learning experience, to see her so proud when she "gets" it, that is a moment of pride I can barely contain. Knowing WE did that. Jan and I helped her, reached her, taught her. That is a moment of pride unparalleled. And what melts my heart? All her tender moments of intimacy and innocence. Sometimes she's just my little sweet pea. I wish I could make her life easier for her so she could have more of those moments. As it doesn't seem that I can, I will enjoy the few that I get to share. If you didn't have your current pets, what pets would you choose to have? I will always have a dog. Just one. But I don't want to daydream Bella's life away thinking of an animal I would prefer. I have thought about adopting a senior dog next time but that's as far as I would be willing to go on this answer. Don't forget - it is also Day 18 of the Advent Calendar for Dog Lovers Event! It's time for the Advent Calendar for Dog Lovers hosted by Kol's Notes, Heart Like a Dog, My Brown Newfies, My GBGV Life & Bringing Up Bella! 24 giveaways in 24 days, plus a grand prize worth more than $500 - who wants to win? Today's giveaway is sponsored by Freshpet. You could win a Freshpet Prize package which includes Yummy Freshpet Treats Made in the USA: Freshpet's NEW Dog Joy Chicken Strips with Flaxseeds, Dog Joy Turkey Bacon, Dog Joy Ready to Bake Cookies, Dognation Chicken Treats and Dognation Beef Treats; an On-the-Go Freshpet Cooler; a Freshpet T-Shirt; Freshpet Coupons AND a Personalized Freshpet Stocking! Loved getting to know you better. Those 'favorite' questions were tough and like you, as soon as I published I thought of things to add/change...and now reading the other posts it's like "oh yeah...Finding Neverland!!! Loved it! Sweet Bella, enjoy any small success. I've never seen Big Fish - I'll have to check it out! Hitch Hiker's Guide is about the only sci-fi I've gotten through and thoroughly enjoyed! This blog hop is awesome - so fun to meet everyone! Loved getting to know you better and wonderful that you answered so many questions. I was little shy still, but hopefully I'll change that in 2014. Your right after I hit publish I felt that I should of answered more. Another Tolkien fan! Thanks for taking the time to link all of your book and movie titles! I love your writing style, BTW. Open, honest, a tad self-deprecating, and a nice touch of humor. *smiles* Thanks for sharing. Oh, books. I love them so. I have not yet read the Sand County Almanac, but now I am adding it to my list! Awesome idea!! Loved getting to know you better. Now to get started on my own and join the hop! And I love Big Fish too. Have you seen it's come to Broadway? I plan on walking into a bar with lots of bloggers at Blogpaws next year, are you going? :) Big fan of Tolkien and Dr. Horrible too! :) I love your picture of you and Bella, you guys are super cute together! Hi! Nice to meet you! I used to be a perfectionist, too...a trait inherited from my Dad...but as I get older, I do a little better each day at accepting myself and life as is. Being that I'm 60+, I guess it's easier than when I was 20+, or 30+, or even 40+...it's just a matter of giving yourself permission to relax and chill out more. Now that wasn't so hard was it? (Asked the girl who only answered five questions.) LOL I so loved and could relate to this, "Just once in my life I would like to look at something I did and not see only its flaws." That is so me, in fact when I show someone something I've done, I feel the need to point out the imperfection to them, so they don't point it out to me. I also like, "so some bloggers walked into a bar." Sign me up. An Indian buffet!!?? I would be in heaven, I love indian food. So nice to learn more about you. Mmm... indian food... love it! Yum! Indian buffet! I love Indian food! I don't think you humans ever thought it all through until now as Mom tells me that a BlogPaws that was the only hard thing - finding the people you know from the blog but had no clue what they looked like. This is a great idea! As soon as I saw "The Constant Gardner" and "Oscar and Lucinda" I knew you were a Ralph Fiennes fan. Me too!!! Gretel is a "damaged" girl. She is such a sweetheart and little pleaser at home but in public she is anxious and scared/aggressive. I love every inch of her though and I know what you mean about the moments with Bella - it brings joy to my heart when I see her make a tiny change in a positive direction for her. For example (this might seem weird to non-dog-crazy folks but....), when she used to feel threatened by another dog she would see red and go nuts viciously barking at them. Now, when she is able to, she will bear her teeth and veer away from them - giving warning signals and giving herself the space she needs to fee comfortable. Thanks so much for sharing some personal things about you! Would animal related food be considered kibble? Meow Mix? Chicken scratch? Live mice? If so, then I have PLENTY of non-animal related food. I learned so much about you here that I never knew!!! I love that your not on speaking terms with your body. Me neither. My body is not cooperating with the snow at all this year! I know what you mean about realizing there were other/better answers after you post. I keep thinking of new things as I read through everyone elses! It was fun getting to know you better, Leslie! You should definitely be proud of Bella. She's come so far thanks to you and Jan.
Now I'm getting nervous that people will hate what I've recommended. ;). I thought Big Fish was whimsical and the final message really resonated with me. I hope it doesn't disappoint. Aw, thanks. We sure do try. I have enjoyed reading everyone's replies and getting to know everyone a little better. I'm so glad so many participated. I had not seen that, Pamela! That could be wonderful. LOL - I am sure you will have plenty of bloggers to catch a drink with. You will have a wonderful time at BlogPaws. I went last May and, while I was overwhelmed, I'm also so glad I went. Meeting the bloggers (and their pets) was the best part for me. I won't be in Las Vegas though - I'm not much of a traveller and really, given my replies here, it probably won't come as a surprise to hear that Vegas would kind of be hell on earth for me (regardless of all the wonderful bloggers I might meet.) I do hope we'll get to meet at another conference in the future thought. Thanks for the encouragement. Sounds like I have about a decade to get over myself and learn to chill a bit more. ;) I am trying, really, I am. I think we need to have a bloggers weekend - no conference, no reason, just get together and hang out. Alcohol will be involved. Thank you - always nice to meet someone who 'gets' it. I've been reading the posts one after another, and I'm amazed at the consistency of some of the answers. So many similarities even though we are different ages, with different backgrounds, living in different areas. We have more in common than just our love of animals! I've been loving this little adventure getting to know everyone. So many different personalities and backgrounds - all bound by our love for animals. FTR, Diane Lane WAS on my list as was Cate Blanchette, Emma Thompson, Rachel Weisz, Paul Bettany, John Cusack and Jonathon Young but I had to stop somewhere. ;) This was not as easy as I thought it would be. But it has been fun. Thanks Marquie. She's worth the effort. And she's done a lot of the heavy lifting herself. We're just her guides. She still has to trust us. We're all hurting here at Casa de Bella this winter. And actually - it's not even freaking winter yet. :o ACK! I DO get that, Jessica. To a lot of people that wouldn't sound like a big deal but we know, we get just how big a deal that really is. 5 years later and we are still figuring things out with Bella. We are grateful to have a very thoughtful and experienced trainer helping us through this. We just had a conversation with her tonight where she pointed out something that I had just never thought of before. It's crazy how much there is to know, learn and remember. I've been doing the same, Vicki and have been struck by the same. I think there are some basic temperaments that are drawn to the solitary pursuit of writing - one of the least surprising being how many readers we have among us. Styles, favorites and interests may vary but the activity itself seems to be of some importance. I have a lot more posts to read but this has been quite fun and rathe educational. LOL - that sounds like a great night out to me! i am nervous now about people saying they're going to check out some of the stuff I said I liked. Please note, A Sand County Almanac is an amazing joy, a slow walk in the woods with a gentle old friend IF you love all the minor details of nature. But the chapter on Draba alone has stayed with me for 30 years. I do hope you like it. Try THIS: Roasted potatoes and whatever veggies you enjoy, sprinkled with a bit of balsamic and cumin before roasting - and then top with crumbled goat cheese right after serving the still warm veggies and potatoes onto your plate. Really enjoyed the rest of this post, but I just had to comment about those two things. Oh, and the post was perfect AS IS. No need to change, edit, or add a thing. My heart just melted when I read the things you wrote about Bella under what drives you nuts about your pets and what melts your heart. So sweet. Thank you so much for co-hosting this hop. I think it's the most blogging fun I've ever had! Loved this Leslie. I love your passion and your enthusiasm and your love for Bella. She is lucky to have you and Jan. I loved all your movie choices and just put A Sand County Almanac on my Amazon wish list. I don't care if you have OCD or not because you are awesome just as you are. I do so wish you could teach me to garden though. It's the one thing I wish I knew more about. I was! I struggled with what to put there, so I'm glad you think it fits. So glad we're friends, lady. So great getting to know you today! I am really enjoying this hop, and think its a fantastic idea to get the bloggers out from the shadows!! We have just joined at #91! Thanks! I'm very excited to be going! Aw, that's too bad :( I hope to catch you at the next one then! I love your answers! There are so many I can relate to. ha-ha, the OCD thing, no wonder I avoided that question! Vonnegut!! Love him, and it's been a long time since I read one of his books...I need to go back and re-read my favorites. To answer your question on my post....that photo was taken on Cardigan Mt. in Canaan, NH. Yes, I live in New Hampshire! I think you're in Mass.? That's actually where both my hubby and I are from....the Western part. Ha ha ha ha your intro made me laugh, mostly because if we were all at an event and someone was missing (let's, for arguments sake, say it's Jen), I would definitely check the bar first. LOL, we're that kind of crowd. I love your movie choices and I would totally watch any of them. Hilarious, touching, heart-felt, and endearing. Your writing is all of these things in just the right measures. I so enjoyed getting to know you better - and I hope you feel you can blog about Bella's "worst" behaviors, because we're here to help, not judge. Oooh, that sounds great, Donna1 I will definitely be whipping this up over the holiday break. Thanks. Thanks. Bella's a good girl, she really is but she has her issues. That makes her accomplishments a little extra special. I'm so glad you joined the hop. To be honest, it had a bigger response than we expected. I've been very proud to be a part of it. I would love to run into you some time. I do hope we all get a chance to meet up one day. Ha, I thought I recognized that view! I love hiking in NH - the views are so amazing. Yes, we're in MA about halfway between Boston and Worcester. Ha! I knew it. I mean, really, where else would that name come from? ;) That's aweome. Thanks, Amy, you are very kind. Re: Bella, I'm not holding anything back deliberately. Some recent issues are on my list to write about. But I also don't like to blog from a "woah is me, all hope is lost" perspective and prefer to have tried a few things before talking about stuff. It doesn't all have to work but even failures add value to the conversation. So we're in the testing phase right now, ruminating and working. We'll share when we know what we need to say. But thank you. It is nice to feel accepted regardless of the issues we face. Anyone who has the patience to garden is awe-inspiring to me. I get fed up planting two dozen impatiens every spring. And I second Pup Fan on that "walk into a bar" thing.